(NEW ALBANY, Ind. )—Promise High School in Madison, Ind. is not a typical secondary institution. It serves the inmate population of the Madison Juvenile Correctional Facility, Indiana’s only maximum-security prison for adolescent females. This summer, the school hired a new social studies teacher: IU Southeast graduate Brian Cole, ’17. For Cole, a U.S. Navy veteran who circled the world twice before retiring to his home town, this position is the culmination of one journey, and the beginning of another. 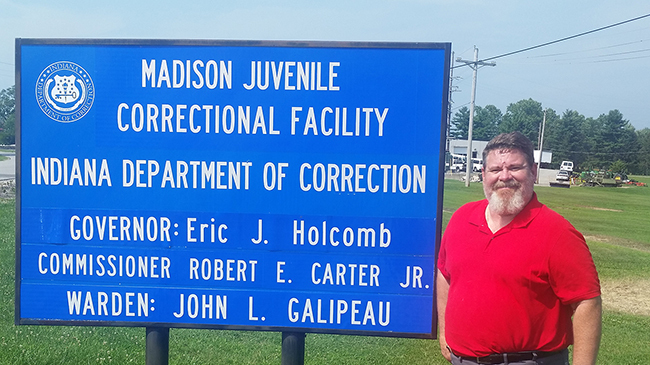 Brian Cole at the entrance to Promise High School, in the Madison Juvenile Correctional Facility in his native Madison, Ind., where he puts his skills, experience and convictions into practice. Photo courtesy of Brian Cole. A Madison native, Cole enlisted in the U.S. Navy during the 1982 recession in order to to gain experience and an education. That initial hitch turned into a career spanning 22 years, during which Cole rose to the rank of chief petty officer (CPO). In that role, he not only mastered an occupation or “rate” (electricity and electronics) but oversaw personnel in his division and was responsible for training junior officers in leadership and management and junior enlisted personnel in general military and job-specific skills in his area. The CPO is known as the “backbone of the Navy,” the person who translates the commands of officers into actions, the one who makes sure that things get done and get done right. The CPO’s toolkit is immense, and includes offering motivation, encouragement, correction, enforcement and much more. Cole mastered these diverse expectations, helping to knit officers and enlisted sailors together in a common purpose, and along the way he discovered a love for instruction. “I enjoyed seeing a light come on,” Cole said. He also enjoyed seeing the world. Cole served on a guided missile frigate, two cruisers and an aircraft carrier, and was on active duty during Operation Desert Storm as well as conflicts in Kosovo and Beirut. He recalls numerous highlights such as visiting Buckingham Palace, celebrating Christmas in Bethlehem, and meeting Pope John Paul II and Soviet Premier Mikhail Gorbachev. Cole and his wife Patricia raised two children during those years of almost constant movement, as his home base continued to change. When he retired, home base became Madison, so that Cole could fulfill a promise he had made to his late mother to care for his elderly father. It was not long before both Cole and Patricia were ready for new horizons. She returned to college to earn an associate of applied science degree and a technical certificate in medical office administration from Ivy Tech. Cole, recalling his love for instruction, enrolled in the secondary education program at IU Southeast, studying under Dr. Bradford Griggs, who was also his advisor and mentor from the first inquiry all the way to graduation in May. Griggs could see right away that Cole had a clearly-defined sense of purpose. Cole dove into academic life at IU Southeast with gusto. His focus on being well prepared and completing tasks, honed in the military, served him well, while his real-world memories enlivened the classroom and enriched the experience for those around him. He selected the social studies concentration because of his love for history, government and geography. Acting on a tip from Griggs, he added four courses to his load in order to earn a Bachelor of Applied Science degree alongside minors in geography and geoscience. He did his student teaching at Austin High School in Austin, Ind., a small community in flux, many of whose young people struggle to find their place in a changing world. The secondary education program at IU Southeast was the perfect preparation for the range of challenges that faced Cole not only in Austin, but also at Promise. In Cole’s view, the world of education is not all that different from aspects of the Navy that he loved most: the awareness of a common purpose, the building of esteem and confidence through achievement, the blend of self-reliance and interdependence. Seeing these connections helped him cope with the potential pressure of sharing a classroom with students half his age. One of Cole’s favorite haunts on campus was the Adult Student Center, where he is fondly remembered, and deeply missed. “I basically lived there,” Cole said. The community of the ASC, in particular Director Kimberly Pelle, was bowled over by Cole’s dedicated presence, enthusiasm and sharing ethic. Kimberly Pelle, director of the Adult Student Center, congratulates Cole at Commencement. “Brian was one student I didn’t want to see leave,” she said. Photo courtesy of Kimberly Pelle. It’s hard not to detect a whiff of destiny in Cole’s new career. A chance conversation with a former acquaintance in the parking lot of his local Kroger led him to apply, and almost before he knew it, he had been hired. 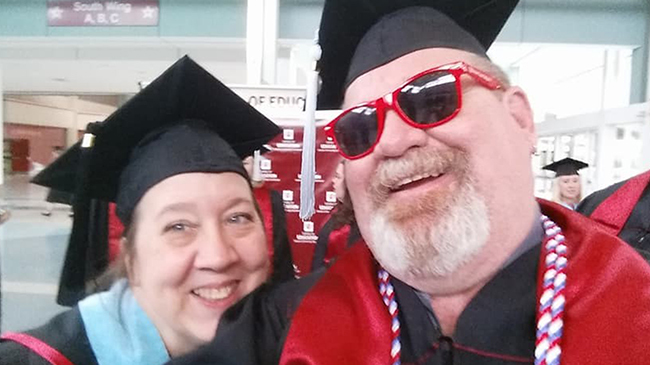 At Promise, Cole says that what he learned at IU Southeast resonates in the classroom every day. For a man who has spent his life advancing the journeys of others, both by what he teaches and by the example he sets with his own actions, Promise is a perfect fit. Homepage photo of Brian and Patricia Cole by Brett Eppley, courtesy of The Madison Courier.